Lucky for you this update is in writing, rather than accompanied by sound or you might hear us warbling songs of spring with great enthusiasm if not skill or talent. 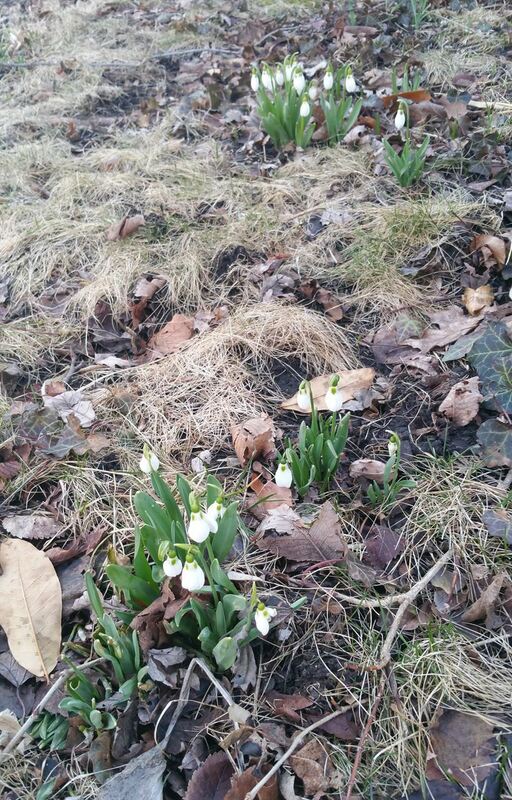 With cautious optimism, at the Institute for Inclusion in the Legal Profession (“IILP”), we’re packing away our snow boots, Program Associate Jenna Meyers is getting her bicycle out of winter storage, and we've spotted some snowdrops sprouting outside our office (right). We survived Chiberia’s polar vortex, braved icy streets and sidewalks without a fall – well, at least not a serious one – and happily reduced our luggage requirements during business travel by half as we no longer need to haul heavy sweaters and bulky coats with us! So, all is good, we got a lot of work done, and now we want to tell you about it! With great appreciation we want to thank Tom White of Schiff Hardin for his service as a member of IILP’s board. Tom helped IILP with its social media committee and has always graciously fielded the occasional IP question for us. Tom, we’ll miss having you on our board but we’re grateful for the time you were able to give us! IILP is pleased to welcome Bruce Byrd, Chief Legal Officer, AT&T Communications, Inc. as the newest member of its board of directors. Bruce is based in Dallas and we’re excited by many of the ideas he has for how the legal profession can make some meaningful strides in its diversity and inclusion efforts! 2019 marks IILP’s 10th anniversary! As our Chair, Marc Firestone, notes, when you consider the number of restaurants that open in New York but that don’t survive a year, for a small not-for-profit launching in the aftermath of the economic downturn of 2008, promoting inclusion (as opposed to the more usual diversity) in the legal profession, and spending its early years having to explain how it was different and why it was needed, to reach ten years is a justifiably proud accomplishment! We realize that we didn’t do it alone. During our first ten years, IILP has been the beneficiary of so many people and organizations who volunteered their help, gave us support, and encouraged us every step of the way. We’re pleased to be able to highlight many of them each week during this 10th Anniversary year. Thank you to all of them for helping us reach this milestone! To see the people behind the scenes and learn about the role they’ve played in helping us to reach this milestone, check out our 10th Anniversary thank yous on our various social media platforms: Follow IILP on Facebook, connect with IILP on LinkedIn, or follow us on Twitter! No doubt you’ve read about the 170 general counsel who, under the name “GCs for Law Firm Diversity” recently published an open letter expressing their commitment to greater diversity among their outside counsel. We applaud efforts such as these as they serve as a reminder that diversity is important to corporate clients. But, we also read Don Prophete’s brave and honest essay expressing the frustration and disappointment of so many diverse law firm partners about the particular challenges they encounter. In an effort to support both the signatories to the open letter and diverse partners like Mr. Prophete, IILP has developed a survey that will allow general counsel who, like the GCs for Law Firm Diversity, would like to offer the legal profession greater transparency about corporate legal spend on diverse outside counsel. IILP Chair Marc Firestone has penned his own Open Letter about this project which you can read here. While individual corporate responses will be confidential and only reported in the aggregate, the survey results will allow the profession to see measurable data on the degree to which corporate clients are directing their legal work to diverse outside counsel. If you are a corporate in-house counsel, please consider encouraging your law department to participate in the survey – it’s only 20 simple questions! – and help elevate the legal profession’s understanding about the use of diverse outside counsel by corporate clients. Our thanks to GCs for Law Firm Diversity and ACC, as well as the assorted general counsel listserves, for helping to disseminate information about the Diverse Outside Counsel survey. IILP had a great year in 2018 and we’ve created a retrospective to showcase the highlights! Take a look at www.TheIILP.com! See how many people and places you recognize! During our ten-year history, IILP has had the benefit of meeting and getting to know many other wonderful organizations involved in trying to make the legal profession more diverse and inclusive. So, we wanted to do something this year that would allow us to work with them again. Reaching out to each and every organization with which we worked during our first ten years, in January, IILP launched #TalkIntoAction. #TalkIntoAction was inspired by the frequent comments that we’ve all heard over the years at different diversity and inclusion programs: “We’re preaching to the choir” or “The people who need to hear this aren’t in the room.” So, #TalkIntoAction was designed to 1) make it easier (or maybe just provide a reason) to bring the information, perspectives, and insights so often shared at diversity programs to the people others thought needed to hear it; 2) encourage advocates to take personal responsibility for diversity and inclusion; 3) foster the building of relationships across lines of difference; and, 4) demonstrate that diversity and inclusion efforts that are meaningful and have impact needn’t be expensive. Participants were invited to reach out to someone who a) had a different diversity background/experience; and b) whom they didn’t know well – someone with whom they had never had coffee or lunch or socialized one-on-one before – and have coffee or lunch together during which they would discuss diversity and inclusion in the legal profession. At the conclusion of their talk, the participants were asked to take a selfie and post it to social media with #TalkIntoAction. We were thrilled to have participants from all over the US and even from the UK and (virtually) beyond! By all accounts, the participants enjoyed it, so we plan to #TalkIntoAction again! Watch for updates! Sometimes our profession has a tendency to only think about D&I in the most traditional settings: Large law firms, large corporate clients, and large bar associations. So, when the ABA Commission on IOLTA and the National Association on IOLTA Programs asked if IILP could join them in Las Vegas to present a diversity and inclusion program on implicit bias that would be relevant to IOLTA, commissioners and staff, we were intrigued. We’ve always seen one facet of our work as seeking to fill gaps so the opportunity to contribute to filling the gap in D&I as it pertains to IOLTA was one we couldn’t refuse. As we anticipated, developing “Implicit Bias Insights for IOLTA Programs” forced us to think about D&I from a different vantage point and develop recommendations that would be relevant for IOLTA programs. And, better still, we had the privilege of working with some very committed and interested IOLTA leaders with whom we might otherwise never have crossed paths. Our thanks to Ellyn Rosen for including IILP. It you’re interested in D&I and IOLTA, visit the IILP website here where you can download IILP’s article on the subject and the hypotheticals we developed to allow IOLTA programs to engage in discussion about the ways that they are most likely to encounter D&I issues. IILP was pleased to participate in the 2019 Corporate Counsel CLE Seminar in San Antonio moderating the Diversity & Inclusion Roundtable on “Are Men the Solution to the Legal Profession's Diversity and Inclusion Problem?” Gail Gottehrer organized a great panel for the program so that we had a lively and thought-provoking discussion featuring Teresa Beck from Buchanan Ingersoll, IILP Advisory Board Member Alan Dorantes from AT&T, and IILP Board Member Sharon Jones from Jones Diversity, Inc.
IILP has had the privilege of frequent collaboration on our UK programs over the years with our friends at the InterLaw Diversity Forum so we were happy to return the favor and participate in InterLaw’s launch of its Apollo Leadership Institute in London. The Apollo Leadership Institute plans to share D&I information, research, and training with senior corporate in-house counsel. Daniel Winterfeldt of Reed Smith LLP and Dr. Lisa Webley discussed InterLaw’s historical and current research while our CEO, Sandra Yamate, shared thoughts on what is (and isn’t) working in the US legal profession’s D&I efforts. We look forward to seeing what develops from the Apollo Leadership Institute. IILP Board Member Sharon Jones of Jones Diversity, Inc. spoke at the March 8th Working Women’s Legal Summit at the Chicago Bar Association. She was part of a panel discussing the current state of women in the legal profession and realistic short- and long-term goals for women lawyers as a group. If you haven’t taken this survey yet, there is still time to do so! “Valuing Diversity” is a research project spearheaded by IILP’s Social Impact Incubator. It is designed to study the degree to which legal employers and individual lawyers value diversity and inclusion. How do legal employers demonstrate their commitment to and support for diversity and inclusion? Are some employers doing more than others? If so, what are they doing? Just how important is diversity and inclusion to individual lawyers? How much impact does an employer’s manifestation of a commitment to diversity and inclusion have when individual lawyers are choosing among several employers? Is diversity and inclusion important enough to individual lawyers that they would consider smaller raises and bonuses if it meant more diversity and inclusion efforts were being made by their employer? Make sure that your opinion is include in the survey results! IILP’s CEO, Sandra Yamate, is now a contributing columnist on Diversity and Inclusion in the Legal Profession for Chicago Lawyer Magazine. Her new column, “Inclusion at Work” (based in part on IILP’s blog) will run bi-monthly. It’s always gratifying when one’s work is appreciated so we’re delighted that IILP Advisory Board Member E. Macey Russell of Choate Hall & Stewart will be part of a luncheon panel discussion on “Leadership Matters for Diversity & Inclusion” at the 2019 SIFMA (The Securities Industry and Financial Markets Association) Compliance & Legal Society Annual Seminar in Arizona. Macey will be sharing some of the findings he has presented at IILP Symposia and parts of our “Competing Interests” papers that he helped to author. The new 2019-2020 IILP Review on the State of Diversity and Inclusion in the Legal Profession is coming soon! It features updated diversity demographics for the legal profession, highlights of some of the most interesting and promising diversity and inclusion programs that we’ve seen, and, as you’ve come to expect, a robust assortment of compelling and insightful articles and essays that examine, probe, and discuss diversity and inclusion in our profession from a wide variety of perspectives. And, in anticipation of the new IILP Review, we’re beginning to schedule the related Symposia on the State of Diversity and Inclusion in the Legal Profession. In addition to many of the cities where we’ve enjoyed presenting symposia in the past – Chicago, Cincinnati, Columbus, New York, Seattle, Los Angeles, Washington, DC, Dallas, and Houston – we’re also expanding the “road show” to include Denver and San Diego. Visit www.TheIILP.com/Calendar for updates on dates and locations! IILP will be participating in the “Women in Leadership” panel at the ABA Section of International Law Annual Meeting, in Washington, D.C., on April 10th. We’ll be joining Stephen Denyer from the Law Society of England and Wales, Rachel Travers of LexisNexis, Pia Logiovane of Phillips North America, and Lisa Savitt of the Axelrod firm to examine gender leadership issues in the profession. One of the best things about IILP’s global diversity work has been learning about programs and strategies from other countries that we think merit consideration in the US. Work allocation is one of those things. We learned that a British company, Mason & Cook, has been working with many of the largest law firms in London to help them address how work is being allocated among lawyers. Company founder Dave Cook spoke about it at our fall Diversity Ops Center program in London where we discuss diversity and inclusion infrastructure issues for global organizations. The more we heard, the more intrigued we were. The London law firms using this custom-tailored work allocation system are seeing better retention of their diverse lawyers, growth in productivity, and increased profitability! It’s win, win, win! We wanted American law firms to learn about this to see whether work allocation might be an effective diversity tool in the US as well as the UK. IILP is coordinating presentations about how work allocation is working and being used in the UK by Dave Cook during the week of April 22nd. We’re going to visit 5 cities in 4 days to give law firms across the US an opportunity to hear about how work allocation works and to gauge whether it might be something they’d like to try. Join us at any one of the following sessions; there is no charge to attend but advance registration is required for the various locations’ security protocols. Application for CLE accreditation is being made in California and Illinois. For more information or to register for any of the sessions EXCLUDING the PLI program on April 16th, visit www.TheIILP.com/Calendar. Speakers/Moderators include IILP Board Members Lorraine McGowen of Orrick Herrington & Sutcliffe and Sharon Jones of Jones Diversity, Inc, as well as IILP author and Rutgers Law Professor Stacy Hawkins and Dave Cook from Mason & Cook. To register: https://www.pli.edu/programs/diversity-inclusion-in-law-practice. Gender diversity isn’t a new subject but there’s a new generation of lawyers ready to take the lead on gender diversity and their thoughts and views may differ considerably from those of previous generations. The Law Society of England and Wales’ recent global research regarding women in law leadership has highlighted findings that suggest that the gender diversity priorities of women lawyers today have changed from what the profession has come to assume were the primary issues about which women lawyers cared. Our friends at the Illinois Supreme Court Commission on Professionalism will be presenting “The Future Is Now: Legal Services 2.019” on May 16, 2019 in Chicago and IILP’s own David Douglass of Sheppard Mullin Richter & Hampton, LLP will be among the speakers. At the program, which is featuring 10 “Big Ideas” from industry thought leaders on adapting to new norms while upholding the core values of the rule of law, David will be sharing ideas from his articles in the 2017 and the 2019-2020 IILP Reviews on the State of Diversity and Inclusion in the Legal Profession. If you had the chance to hear David at one of our Symposia last year, you know that attendees at “The Future is Now” are in for a bold and thought-provoking presentation! Register at: https://www.2civility.org/the-future-is-now-2-019/register/. At IILP we appreciate all the compliments we receive about how much people throughout the legal profession like the work we’re doing, the different approach we’re taking, and the strategic thoughtfulness of our model of inclusion. But, just as we’re celebrating our 10th anniversary by thanking the many individuals behind-the-scenes who helped us reach this milestone, we acknowledge that if we’re to think ahead to a 20th, 25th, and 50th anniversary and beyond, we’ll continue to need the help, support, and friendship of many others. So, if you’ve the time, interest, and inclination, we’d welcome your involvement. Janet Lee, one of our very first interns, who spent two summers with IILP, just completed a judicial clerkship and has started working as an associate with Winterfeldt IP Group in Washington, DC. Chicago’s loss is New York City’s gain: Michelle Musielewicz graduated from NYU Law School this summer, took the bar exam, and will be starting with Davis Polk & Wardell LLP in New York this fall. Hannah Kelly has returned to New England. Hannah received a full scholarship to study at the Harvard Graduate School of Education and will be graduating next summer. We’ve been so fortunate in the bright, talented young people who have worked at IILP! Our new Program Associate is no exception. Please join us in welcoming Jenna Meyers to IILP. Jenna is a graduate of Loyola University of Chicago and, in what free time she has, a theater stage manager. We’re looking forward to her applying her stage-managing skills to IILP programs! The IILP Review 2019: The State of Diversity and Inclusion in the Legal Profession is moving forward! We’re excited to report that once again, you can expect an impressive collection of articles and essays examining a wide variety of diversity issues. Our Editor-in-Chief, Professor Philip Lee from the University of the District of Columbia David A. Clarke School of Law has updated all the available and relevant diversity and inclusion demographics and statistics and the Diversity in Practice Round-Up will feature a robust assortment of interesting and promising diversity and inclusion programs and strategies that might inspire new or renewed diversity and inclusion efforts. The new IILP Review 2019 should be available sometime during the first quarter of 2019. If your organization is interested in advertising opportunities in it, please contact Jenna Meyers at Jenna.Meyers@theIILP.com. IILP was pleased to work with Maureen Mulligan of Peabody & Arnold who is co-chaired the Spring Meeting of the ABA Tort Trial and Insurance Practice Section to present, “Moving Women into Positions of Power: Men as Allies and Champions.” IILP Board Member Floyd Holloway co-moderated the session that featured Alan Bryan, Senior Associate General Counsel Legal Operations, Walmart; Linda Chanow, Executive Director of the Center for Women in Law at the University of Texas; D’Arcy Kemnitz, Executive Director, National LGBT Bar Association; and Cathy Schwamberger, Associate General Counsel, State Farm. What is it like to be a diverse lawyer practicing in a smaller city? What are the pros and cons? What can/should/are the management of employers in mid-size cities be doing to better recruit and retain diverse lawyers? How can bar associations enhance the career success of diverse lawyers in mid-size cities? The first finished video should be ready soon and we hope it will be a useful tool for both diverse lawyers and employers. Our Charlotte Symposium on the State of Diversity and Inclusion in the Legal Profession was exciting for a number of reasons: first, it’s always nice to get to visit the Queen City; second, lawyers in the Southeastern US always give us such a warm welcome; and third, we were pleased to be able to bring together a program of which we could be very proud! Thank you, Bank of America – especially Ray Abbott, Todd Stillerman, Lani Quarmby, Melissa DiPento, and Marilyn Nastiuk – and the Mecklenburg County Bar Association – especially Nancy Roberson, Carmen Thomas, and Lisa Armanini – for all of your help in arranging and presenting the Symposium. And thank you to all our speakers and panelists: Kathryn-Ann Bloomfield, Assistant General Counsel, Bank of America Merrill Lynch and IILP Social Impact Incubator Member; Michael Boykins, Partner, McDermott Will & Emery LLP; Jill Lynch Cruz, JLC Consulting; Maria Green, Senior Vice President and General Counsel, Ingersoll-Rand; Jon Harmon, Michelle C. Ifill, Senior Vice President and General Counsel, Verizon Corporate Services Group; Partner & Chairman, McGuireWoods LLP; Richard E. Meade, Chief Legal Officer - International, Prudential Financial (Ret. ); Brandon R. Mita, Associate, Littler Mendelson P.C; Meredith Moore, Global Diversity & Social Responsibility Director, Weil, Gotshal & Manges LLP; E. Lani Quarmby, Associate General Counsel & Managing Director, Bank of America; Macey Russell, Partner, Choate Hall & Stewart LLP; Timika Shafeek-Horton, Duke Energy and President-Elect, Mecklenburg County Bar Association; and Angela Winfield, Director, Department of Inclusion and Workforce Diversity, Cornell University. Right on the heels of Charlotte, IILP was off to Boston for the first Boston Symposium on the State of Diversity and Inclusion in the Legal Profession. It’s always a bit nerve-wracking going into a city where we haven’t presented a Symposium before but thanks to the great folks at Vertex Pharmaceuticals – Damian Wilmot, Kathy Deschene, Kathryn Van Wie, and Julie Fogarty – and IILP Advisory Board Member E. Macey Russell, Partner, Choate Hall & Stewart, the Boston Symposium was very well-received. Thank you also to the speakers and panelists whose participation allowed us to present an informative and compelling program, the likes of which, we are told, Boston hadn’t seen before but needed. So thank you: Susan H. Alexander, Executive Vice President, Chief Legal Officer and Secretary, Biogen; Emanuel Alves, Senior Vice President and General Counsel, John Hancock; Robert Bodian, Managing Partner, Mintz Levin Cohn Ferris Glovsky and Popeo P.C; Roberto Braceras, Partner, Goodwin Procter LLP; Keith H. Earley, Adjunct Faculty, Georgetown University School of Continuing Studies; Rachel Hodge, IILP Social Impact Incubator Member; Douglas Hallward-Driemeier, Partner, Ropes & Gray LLP; Sharon E. Jones, CEO, Jones Diversity Group LLC; Nigel W. Long, Corporate Counsel – Litigation Group, Liberty Mutual Insurance; Traci L. Lovitt, Partner-in-Charge - Boston, Jones Day; Deborah J. Manus, Managing Partner-Boston, Nutter McClennen & Fish LLP; Meredith Moore, Director, Global Diversity and Social Responsibility, Weil Gotshal & Manges LLP; Maureen Mulligan, Partner, Peabody & Arnold LLP; Michael J. O’Connor, General Counsel, Massachusetts Mutual Life Insurance Company; Damian Wilmot, Senior Vice President, Chief Risk & Compliance Officer, Vertex Pharmaceuticals Incorporated; and Steven Wright, Managing Partner-Boston, Holland & Knight LLP. And special thanks to the Boston sponsors: Choate Hall & Steward, Cooley LLP, Foley Hoag LLP, Jones Day, Ropes & Gray, Skadden Arps. Diversity and Inclusion: A Professional Responsibility? In the US, diversity is often considered a part of professional responsibility. But is it? And, if it is, is that a purely US phenomenon? IILP decided to explore that issue with two London presentations of “Diversity and Inclusion: A Professional Responsibility? UK and US Perspectives and Experiences.” London, as you may know, is a big city, so we presented the program on Canary Wharf – thank you Clifford Chance! Especially Laura King and Sarah Twite – and in The City – thank you, Eversheds! – with tremendous help and support from our friends at the InterLaw Diversity Forum – thank you so much, Daniel Winterfeldt and Jonathan Leonhart! We were fortunate to have the expertise of Ellyn Rosen, Regulation and Global Initiatives Counsel at the ABA Center for Professional Responsibility and Sophia Adams-Bhatti, Director of Legal and Regulatory Policy at the Law Society of England and Wales frame the discussion for us with real world commentary, experiences, and perspectives fromChristina Blacklaws, Vice President, The Law Society of England and Wales; Dan Fitz, Company Secretary, BT Group plc; Sajid Hussein, General Counsel EMEA, Bank of America Merrill Lynch; David A. Jackson, Global Head of M&A and Strategic Transactions Legal, Barclays; Laura King, Partner, Global Head of People and Talent, Clifford Chance; John H. Mathias, Jr., Partner, Jenner & Block; Sharon E. Jones, CEO, Jones Diversity; Tracey Dovaston, MD, Head of Litigation, Investigations & Enforcement EME, Barclays Legal; Emma Slatter, Chief Officer, Legal and Regulatory, Visa Europe. The program was so successful that yes, American lawyers, we’ve heard you and we are trying to find a way to repeat the program for you! This year has seen a lot of talk, email notices, and website alerts about GDPR. Data privacy is a hot topic. But what many lawyers fail to appreciate is that data privacy is not just something that the IP and tech lawyers need to think about. It has a compelling diversity component, too. And if you know IILP, you know, we love to think about and discuss these sorts of things. So, with the help and support of Reed Smith LLP – John Iino and Pauline Veseleno, we couldn’t have done it without you! – we were pleased to present “Diversity and Data Protection in a Digital World.” The program was the brainchild of Huey Tan, Senior Legal Counsel at Apple and explored the way diversity issues intersect with data privacy issues. Huge thanks to our panelists: Richard Hunter, Senior Counsel, Privacy and Data Security, Abbott; Huey Tan, Senior Privacy Counsel, Apple Asia ; Alicia Young, Head of Privacy, Cybersecurity and Intellectual Property, Legal (Asia Pacific), J.P. Morgan; Xiaoyan Zhang, Counsel, Reed Smith LLP; Ann H. Chen, Senior Counsel, Social Media and Digital Assets, Abbott. The program received such positive feedback that we’ve been asked to repeat it and so we shall! We’ve heard from lawyers around the country requesting that we present this program in their cities (don’t worry, Boston, we haven’t forgotten your many requests!). The next presentation will be in Chicago on November 7th and will be hosted at the Chicago offices of Microsoft. Panelists will include: Richard Hunter, Senior Counsel, Privacy and Data Security, Abbott; Xiaoyan Zhang, Counsel, Reed Smith LLP; Ann H. Chen, Senior Counsel, Social Media and Digital Assets, Abbott; and Alex Simpson, Attorney, Microsoft. To register: http://www.theiilp.com/event-3091614. In addition to launching its Valuing Diversity survey (above), the Social Impact Incubator has been learning about the history of diversity and inclusion efforts in the US. They have been interviewing lawyers who have particular insights into how the legal profession has addressed diversity and inclusion, including mistakes it may have made. During the group’s summer meeting in Washington, D.C., they had the opportunity to interview David Douglass, Sheppard Mullin Richter & Hampton LLP’s DC office managing partner and D’Arcy Kemnitz, the Executive Director of the LGBT Bar Association. The group has also started getting together when they are in each other’s cities. We had a small group come together at Lavender Law and at the Hispanic National Bar Association convention. The Social Impact Incubator members will be undergoing media training during their upcoming Chicago meeting. IILP enjoyed the chance to participate in the National Conference of Women’s Bar Associations Bar Leadership Summit and speak on a lively panel titled, “Women in Leadership: How to Increase Female Representation at the Highest Levels.” It was a genuine pleasure to work with Patricia Jarzobski, Jessica Brown, Paula Holderman, and Christina Blacklaws, and the inestimable Diane Rynerson! IILP looks forward to getting to know NCWBA better and future opportunities to work together. In June, when IILP was in London to present “Diversity and Inclusion: A Professional Responsibility?” we learned about an interesting gender diversity project that the Law Society of England and Wales was conducting under the leadership of its president, Christina Blacklaws. After surveying over 7,000 lawyers about gender diversity issues, they are embarking upon a series of roundtables around the world to flesh out some of the data they have collected. IILP was pleased to be able to help coordinate a roundtable discussion in Chicago that was hosted by Jenner & Block LLP. Thank you to Jenner & Block partners Terri Mascherin, Debbie Berman, and IILP Partner John Mathias for helping to make the roundtable a success! The LGBT Bar Association’s annual Lavender Law conference was in New York City and IILP was honored to get to participate. We joined Gretchen Bellamy from Bellamy Consulting;Brian Winterfeldt from the Winterfeldt IP Group; and Daniel Winterfeldt from Reed Smith LLP for a discussion on “Cross Border Equality: LGBT+ and Intersectionality in the US and UK Legal Sector. And we got to applaud Social Impact Incubator members Bendita Cynthia Malakia and Kylie Byron as they took to the podium in front of a packed ballroom to help introduce some of the honorees at this year’s conference. It was nice to get to return to Columbus to present a Symposium on the State of Diversity and Inclusion in the Legal Profession, this time partnering with our friends at the Columbus Bar Association. We always get such a warm reception in Ohio and this time was no exception as we had a fairly full house! Thank you to the speakers and panelists, as well as the Columbus Bar staff who made the event such a success: David L. Douglass, Partner, Sheppard, Mullin, Richter & Hampton LLP; Rachel Hodge, IILP Social Impact Incubator Member; Melinda S. Molina, Associate Professor, Capital University Law School; Margo Wolf O'Donnell, Partner, Benesch, Friedlander, Coplan & Aronoff LLP; Kimberly S. Amrine, Director of Diversity and Inclusion, Frost Brown Todd LLC; Patrick Belville, Vice President, Associate General Counsel, Mergers & Acquisitions, Cardinal Health; Martiné ("Marty") R. Dunn , Partner, Dinsmore & Shohl LLP; Marie-Joëlle C. Khouzam, Partner, Bricker & Eckler LLP; Carl D. Smallwood, Partner, Vorys, Sater, Seymour and Pease LLP. And special thanks to: Samuel Peppers, the Columbus Bar Association Executive Director; Judy McInturff, CBA Director of Continuing Legal Education; Isabel Sturgill, CBA CLE Program Coordinator, and sponsors Vorys, Sater, Seymour, & Pease LLP; Porter Wright Morris & Arthur LLP; Ice Miller LLP; and Bricker & Eckler. The Conference of World City Bar Associations convened in Chicago in September. This annual conference brings together delegates from many of the major metropolitan bar associations around the world, including New York City, London, Amsterdam, Paris, Barcelona, Tokyo, Istanbul, Shanghai, Toronto, and Frankfurt to name a few. IILP was pleased to be invited to make a presentation about its global diversity and inclusion work. And we were pleased to be invited to present programs in Barcelona and Shanghai. IILP will be presenting a day long program looking at gender diversity issues in a global legal profession for the next generation of women lawyers. It will take place in London on June 5th! Visit IILP’s website at www.TheIILP.com for more details as they become available. Our Inclusion at Work blog gets many favorable comments. But we need more writers so if you’re inclined, please let us know! We’d welcome adding you to our pool of bloggers! Let Jenna Meyers know that you’re interested, and we can schedule time to discuss it with you further. You can reach Jenna at Jenna.Meyers@TheIILP.com. Next year, IILP will be celebrating its 10th Anniversary. That we’ve survived this long and, through our work and programs, managed to earn the respect of so many people whom we, in turn, respect and admire is humbling. We feel honored that people take the time to work with us, help us, and compliment us on our work and the role we’re playing in our profession’s diversity and inclusion efforts, especially given that we really like our work and we truly enjoy the people with whom we get to work. We’re fortunate to get paid (albeit modestly ) to do work we love. But we are well aware, and don’t have to tell you, that there remains much work left to be done. When your time permits, you’re always welcome to join in IILP’s efforts! We’d be honored! Greetings from the Institute for Inclusion in the Legal Profession ("IILP")! You’ve likely received our earlier notices about some of our new efforts, but knowing how busy everyone is, we thought you might appreciate a quick update on IILP’s other activities. If you haven’t read them yet, you can still download IILP’s new series of papers, “Competing Interests” at no charge from our website at www.TheIILP.com/Publications. This three-part series of papers examine a previously unrecognized aspect to the legal profession’s ongoing challenge to become more diverse and inclusive: what happens when diversity, as a core value, is forced to compete with other core values in corporations and law firms. Specific recommendations for lawyers, law firms and corporate law departments that explain how to address these concerns, and why. The papers detail how corporate preferred provider programs that decrease the number of law firms eligible to handle a company’s legal work so as to gain more efficiency and better pricing are impacting the ability of diverse lawyers to secure that work. And the competition between diversity and other core values are not limited to corporations. Law firms that insist upon direct connections between their support of diversity and business generation are adversely impacting the profession’s diversity efforts as well as their own firm efforts. For many within the legal profession there is a lot of talk about diversity and inclusion but not nearly enough action. “Competing Interests” offers the legal profession specific, concrete actions that can result in meaningful action. “Competing Interests” is the result of the experiences, candor, and thoughtful analysis of its contributors: E. Macey Russell, Choate Hall & Stewart LLP; Marci Rubin, California Bar Foundation Board of Directors; David Douglass, Sheppard Mullin Richter & Hampton LLP; and Martin Greene, Zuber Lawler & Del Duca LLP. Our thanks to them for this labor of love! A Practice Round-Up that highlights the most promising strategies and programs to advance diversity from across the US. This is the IILP’s fourth review and contains data updated as of September 2016. The Review is available at no charge and can be accessed: http://www.theiilp.com/IILP-Review-2017. Hard copies are being mailed to the General Counsel of the Fortune 500, the Chairs of the 250 largest law firms in the country, the deans and placement offices of all accredited law schools, and all IILP Partner and Ally firms and corporations. Thanks to Editor-in-Chief Elizabeth Chambliss and all of the authors, editors, and everyone who submitted information for the Practice Round-Up. And special thanks to our friends at The Claro Group for their continued sponsorship and support! Some of us have been toiling in the diversity and inclusion vineyard for a long time. A VERY long time. As subject matter experts, we speak at a lot of conferences and programs and get asked to lead, or be involved in, many of the most interesting diversity and inclusion initiatives taking place. But what happens once we’re gone? Katie Larkin-Wong from Latham & Watkins LLP will be chairing the new Social Impact Incubator. We’re expecting great things from this group! IILP worked with Philip Morris International, the Cyrus R. Vance Center for International Justice, and the New York City Bar Association to present “Diversity and Inclusion in the Latin America Legal Profession” on June 5, 2017. We were honored to have Ambassador Mari Carmen Aponte as the keynote speaker! The program focused on the diversity expectations and demands of corporate clients in Latin America, the research available, and better practices for law firms in Latin America. We were pleased to see so many law firms based primarily in Latin America attend. The program culminated with a reception at which several of the corporations recognized those of their Latin American outside counsel whose diversity efforts merit recognition. Thank you to the corporate participants: General Electric; Honeywell International; Mondelēz International; Philip Morris International; and Walmart. And much gratitude to the sponsors: Baker & McKenzie LLP; Hunton & Williams LLP; Kirkland & Ellis LLP; and Shook Hardy & Bacon LLP. On March 27th, we presented our first Symposium featuring the new 2017 IILP Review. Our thanks to Hewlett Packard Enterprise for hosting the program (with a wonderful welcome from Brian A. Tippens, Chief Diversity officer) and to all the authors who presented: Collette Brown, Neal Gerber Eisenberg LLP; Jay Mitchell, Skadden Arps Slate Meagher & Flom LLP; Brian Winterfeldt, Mayer Brown LLP; Brandon Mita, Littler Mendelson P.C. ; Angela Winfield, Northeast ADA Center; Kori Cordero, Tribal Law and Policy Institute; and Meredith Moore, Weil Gotshal & Manges LLP. For this program, the innovative panel discussion, “Diversity and Inclusion in the Tech Industry: Corporate Law Departments and Their Outside Counsel” focused on what’s actually being done in the real world of Silicon Valley’s legal profession and beyond. Thank you to the very candid and forthright panelists: Willie Hernandez, Hewlett Packard Enterprise; Andy Hinton, Google; Sang Kim, DLA Piper; Caren Ulrich Stacy, DiversityLab; Quyen Ta, Keker, Van Nest & Peters; and Monica Zent, ZentLaw as well as our Moderator, Marci Rubin. Thanks also to Patricia Lee and the State Bar of California Council on Access & Fairness for handling the CLE accreditation and our Host Committee: Tammy Albarran – Covington & Burling LLP; Rajiv Dharnidharka – DLA Piper LLP; Joan Haratani – Morgan Lewis & Bockius LLP; Willie Hernandez – Hewlett Packard Enterprise; Rew Ikazaki – Tesla Motors; Committee Chair Kenton King – Skadden, Arps, Slate, Meagher & Flom LLP; Shannon Kung – Skadden, Arps, Slate, Meagher & Flom LLP; Felix Lee – Fenwick & West LLP; Christophe Mosby – Hewlett Packard Company; Amy Park – Skadden, Arps, Slate, Meagher & Flom; Committee Co-Chair Marci Rubin – California Bar Foundation; Michelle Uddin – The Claro Group; and, Robert White – California Minority Counsel Program. We are grateful for all the enthusiastic comments we received from attendees but it couldn’t have been done without all of these lawyers’ help and support! On March 29th, IILP presented “The Ethics of Diversity and the Economics of Inclusion,” hosted by Exelon Corporation at their Chicago headquarters. After a rousing keynote address by William Von Hoene, Exelon’s Senior Executive Vice President and Chief Strategy Officer, Macey Russell from Choate Hall & Stewart presented an overview of IILP’s new “Competing Interests” papers. We asked a panel of law firm chairs, executive committee members, managing partners, and practice group leaders to discuss the papers and provide their thoughts on the validity of the findings and the feasibility of implementing the recommendations. Out thanks to Larry A. Barden, Chair, Management Committee and Member, Executive Committee, Sidley Austin LLP; Reginald J. Hill, Member, Management Committee, Jenner & Block LLP; Christina Martini, Member, Executive Committee, National Hiring Partner and IP Practice Group Leader, DLA Piper LLP; Gus Siller, President-Elect, Brinks Gilson & Lione; Michael Wagner, Member, Executive Committee, Baker & McKenzie LLP; Diane E. Webster, Partner-in-Charge of Chicago Office, Hinshaw & Culbertson LLP; and our moderator, Lorraine McGowen, Partner, Orrick Herrington & Sutcliffe LLP. We thought it important to also seek the reactions and comments of corporate clients. What did they think about these findings and would their corporations be open to implementing any of the recommendations? Thank you to Earl J. Barnes, II, Senior Vice President & General Counsel, Advocate Health Care; D. Cameron Findlay, Senior Vice President, General Counsel & Secretary, Archer Daniels Midland; Elena Kraus, Senior Vice President and General Counsel, Walgreen Co.; Deborah Lloyd, General Counsel, GE Power & Water; Thomas O’Neill, Senior Vice President and General Counsel, Exelon and moderator Sharon E. Jones, CEO, Jones Diversity Group for a stimulating and lively discussion! Access Success showcases attorneys and law students with disabilities and introduces them to law firms and law departments interested in expanding their own networks of able counsel. IILP was excited to be a part of this, the inaugural presentation, and to work with the Chicago Bar Association’s Young Lawyers Section; the National Association of Attorneys with Disabilities; the ABA Commission on Disability Rights; the ABA Law Practice Division; and Taft Stettinius & Hollister LLP. Special thanks to Jennifer Byrne, Bob Furnier, and our own Hannah Kelly for all their work! IILP was delighted to participate in Ms. JD’s “P.R.O.P.E.L.” conference. It was an energetic conference and impressive to see the passion and vigor with which Ms. JD is approaching the diversity and Inclusion challenges of the profession. IILP was pleased to make a presentation about its work, challenges in the diversity and inclusion arena, and hot and trending topics in diversity at the Circuit Court of Cook County’s First Municipal District Advisory Committee Meeting. As many of the participants are judges, prosecutors, public defenders, court personnel or work in solo practice or for small firms or Legal Aid, Legal Assistance or other not-for-profit entities, we were especially happy to be able to speak with this group as they serve as a good reminder that diversity and inclusion in the legal profession is not only something that those in large corporations or Big Law are concerned about or impacted by. It’s a big profession and we all have a stake in this. Thank you, Hon. E. Kenneth Wright for the opportunity! IILP was honored to be part of the Texas Hispanic Journal of Law and Policy’s 2017 Symposium on “Understanding Diversity in Legal Academic and Work Environments” at the University of Texas Law School in Austin. It was exciting and inspiring to see how the law students involved in the program were so engaged in discussing how issues of race and other forms of diversity are being addressed in law school and beyond. Kudos to everyone involved in organizing this stimulating program! IILP gets many requests to have our programs webcast or filmed for later viewing. But one of the things that make IILP programs so interesting to our audiences is the degree of candor and personal insights so many of our speakers and panelists bring. Therefore, we’ve embarked upon a project to film interviews with speakers and select portions of certain programs with an eye toward creating videos that provide the same substance and information but allow our speakers a degree of control over what gets online later. Thus, they have an opportunity to be completely open when they speak at our programs knowing that anything too candid won’t haunt them (at least not from IILP). Lead by IILP Advisory Board Member Barrington Lopez, IILP has started filming video segments with the help and support of interviewers Danielle Phillip and Rashad Morgan from Brinks Gilson & Lione and Sharon Jones of Jones Diversity. This will be the IILP’s fifth review and will contain data updated as of September 2018. The Review will be available at no charge here on our website. Stay connected to access it when we're live! Hard copies will be mailed to the General Counsel of the Fortune 500, the Chairs of the 250 largest law firms in the country, the deans and placement offices of all accredited law schools, and all IILP Partner and Ally firms and corporations. Thanks to Editor-in-Chief Philip Lee and all of the authors, editors, and everyone who submitted information for the Practice Round-Up. And special thanks to our friends at The Claro Group for their continued sponsorship and support! In conjunction with the publication of the upcoming 2019 Review, IILP will be convening Symposia on the State of Diversity and Inclusion in the Legal Profession. Please check back at this page for the upcoming dates of Symposia. Our final Symposia based on our 2017 Review will be in Chicago, October 23, 2018. If your bar association or firm would like to co-sponsor one or more of the Symposia at no cost so that your members may register for any Symposium at a 50% discount, please contact Jenna Meyers at jenna.meyers@theiilp.com for details. There’s a lot to be done and a lot more we’d like to do! We could use your help. Please let us know if you’re interested in serving on a Host/Planning Committee for an upcoming Symposium or undertaking a research project. Write a response to one of our blog posts or share/retweet our posts! Or, just attend one of our programs when we’re in your city and bring others who aren’t the “usual suspects.” We’re always happy to see you!